WWW"fermelesbouts"com - Please visit for more details, booking direct and our excellent reviews. "Grenier Les Bouts is a true gem. 115yrs old it's a free standing stone building for a couple. Closest chairlift is 7mins drive, 10mins drive to Morzine & 1hr15mins to Geneva. Outstanding views, top of the range exceptional accommodation. Ski, bike, walk, swim on the doorstep. Village location with local restaurant. You won't be disappointed." We are a family run business and live here in our farmhouse ‘Ferme Les Bouts’. We truly believe we live in a corner of French mountain paradise and are excited that you are interested in staying here for your holiday. What more could you want than indulging in snow sports through the winter and exploring the mountains on bikes and foot through the summer. Ferme Les Bouts is located in the sleepy village of La Cote d’Arbroz, only 10 minutes drive from Morzine, and 6 minutes drive to the nearest chair lift on Mont Chery, Les Gets. 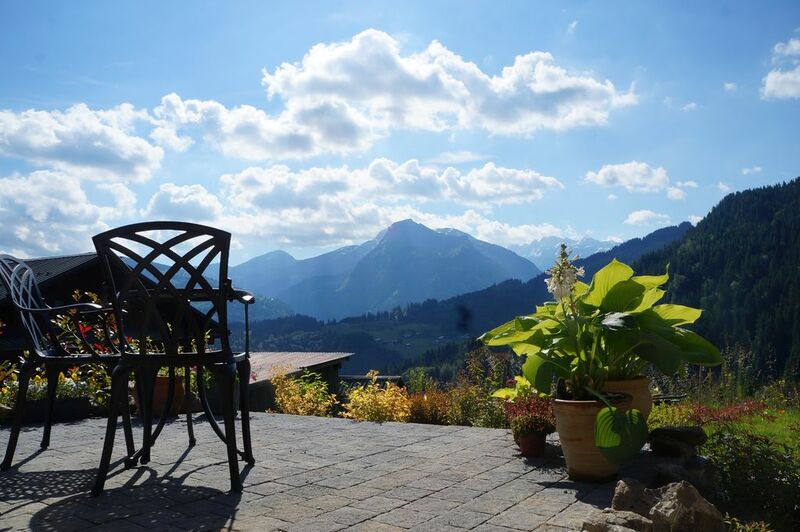 With views we feel are some of the best in the valley, across to Montriond, the Ardent Valley and up as high as Avoriaz, we are in an idyllic position for you to explore the whole area all year round with so much right on the doorstep. We purchased Ferme Les Bouts in 2013 and completed renovating both of our rental properties in 2016. Both our properties are unique and individual: Petite Ferme Les Bouts is a spacious self contained 3 bedroom property within the main farmhouse, sleeping up to 6 guests, while Grenier Les Bouts is a detached stone building providing a luxurious mountain escape for a couple. La Cote d’Arbroz village has it’s own restaurant only a 5 minute walk from us where you can also order fresh bread and croissants daily. Essert Romand at the bottom of the hill 3 minutes away offers La Petite Auberge restaurant as well as a small pizza take away. There are many more restaurants in Morzine, Les Gets, Montriond and the surrounding villages for you to try out….please ask us for our top choices. 12 villages make up the Portes du Soleil, and La Cote d’Arbroz village at 1200m altitude rubs shoulders with the charming alpine village of Morzine, probably the best known of the villages. Morzine bursts with alpine charm throughout the year with outstanding winter lights through the snowy months and stunning flower displays in the summer. Ice rinks and horse drawn carriages are all part of daily life here in the winter, while bustling local markets, spectacular flower displays, mountain meadows scattered with alpine flowers and herds of bell wearing cows are what we are about in the summer. Whether you want to hop on your bike, ski the back country, hike the mountains, swim in the lakes, sail across Lake Geneva or relax at a mountain restaurant with a vin chaud or refreshing glass of rose, you will not tire of the activities there are to do here. The mountains offer something for everyone and you won’t be disappointed. During the winter the Portes du Soleil boasts to be one of the largest ski playgrounds in the world with 196 lifts and an amazing 650km of skiable terrain. The area offers skiing for all abilities and allows you to ski across the French-Swiss border as you please. Summer months it’s known to be the mecca for mountain bikers with thousands of kilometres of down hill and cross country trails available. In addition road bikers are in their element enjoying miles and miles of stunning routes throughout the Haute Savoie region. Your own transport is necessary, as there are currently no public transport links to and from the village, however private transport for your stay can easily be arranged. Please ask and we will be more than happy to help. Come and enjoy the stunning French Alps this year and get to know our extraordinary back garden! Grenier Les Bouts is a true gem perfect for a couple on a romantic break or honeymoon. Recently renovated to a superb standard, this luxury mountain escape offers stunning, far reaching views across the Portes du Soleil, of which we promise you will not tire. It is a detached stone building over 115 years old previously used for grain storage for the main house and farm. Set over 2 floors, we have couples in mind who want to hide away and experience a mountain holiday at its best. No detail has been missed here, from your welcome hamper on arrival to the handmade wooden chairs on the balcony. The out of plumb walls and wonky original front door are all part of its charm! The upper floor comprises of an entrance through patio doors from the balcony into an open plan living area exposing the high vaulted ceiling. The snug lounge area, together with a log burning stove, creates a wonderfully cosy atmosphere where you can curl up on the sofa during those snowy winter nights. You can enjoy vin chaud on the balcony in the winter watching the snow glisten or a cool glass of wine in the summer while listening to the trickling stream below and cow bells in the meadows. Stairs lead downstairs to the bedroom and ensuite shower room. There are further French patio doors from the bedroom leading onto a private patio with bistro table, chairs and top of the range BBQ. We know you won't be disappointed with choosing to stay in this unique hideaway and as a result will want to come back again and again. There is nothing that comes close to this gorgeous little property in the area. -Welcome hamper on your arrival. We also own a spacious 3 bed property sleeping 6 people situated next door. Renting the two properties together would be ideal for a larger family or friends holidaying together. Most holiday makers head to Morzine – Avoriaz in the winter to enjoy the 650km of skiable terrain on offer. The vast area offers skiers and snowboarders alike varied pistes. There’s excellent beginner pistes including covered magic carpets to the well known Swiss Wall or La Chavanette which starts you in France before quickly plunging you steeply down into Switzerland. All lift pass information can be found online or by calling into one of the lift pass offices in Morzine by Pleney and Super Morzine lifts. To help you decide which lift pass is best suited for you and the rest of your party you will need to look at the various pass areas found online. We strongly advise that you pre-book all your ski hire before your holiday and highly recommend Ski Mobile. Ski Mobile takes the hassle out of hiring your ski equipment. You simply need to order online and they will deliver right to the door. They even come with their mobile shop, so if what you have ordered doesn’t fit they have other sizes for you to try. Don’t forget to mention Ferme Les Bouts to get a 20% discount. Click here for ski hire with Ski Mobile. You will need to tell them which property you are staying in. There are many ski schools in the area for you to choose from who offer group and private lessons. Head online to Morznet and look up ski schools. Other activities during the winter include swimming, snow shoeing, husky sledding, ice skating and parapenting. Please enquire with the tourist information office for further details. Summer time in the French Alps is sensational. With activities available everywhere you look you will not have time to sit and enjoy the balcony view… if that is exactly what you want to do then make sure you bring a good book and our view will be waiting for you! The Multi Pass Portes du Soleil offers unlimited access to a massive choice of activities and facilities in all 12 village-resorts. Follow Morznet online to find out more details. Morzine, Les Gets, Avoriaz, & the whole Portes du Soleil (PDS) area is a mecca for mountain bikers, with thousands of kilometres of down hill and cross country trails available. The lift system is vast, bike park areas throughout plus you will not be able to forget the stunning mountain scenery. Road biking is a popular spot for road cyclists. The Tour du France has been hosted here over 20 times. The area is diverse and has routes available for all abilities. Morzine pool in the centre of the town (below the suspension bridge) is a great pool complex. During the winter it offers a 25x15m pool (heated to 27°C), a 12,50x10m teaching pool (heated to 28,5°C), a 50 m2 paddling pool (heated to 31°C) and a 160 m2 spa area with saunas and Turkish baths. During the summer the complex also extends to a 50x21m olympic pool (heated to 27°C), a teaching pool, a paddling pool with many water games, a giant 80m waterslide, a bouncy castle, a beach volleyball court plus a grass recreation area. There is a further pool in Avoriaz plus the lakes of Montriond and Les Gets (which has a water slide). Don’t also forget Lake Geneva, which has many perfect spots for a dip. It is free to swim in Lake Montriond, however Les Gets charge a small fee. Further afield are Lake Annecy and Lake Passey. Please enquire with the tourist information office for further details. I have lived in France for over 5 years with my family and love the way of life offered in the mountains. We love to explore the area in all seasons and are lucky enough to enjoy the vast ski area during the winter and the many activities offered during the summer months. The scenery is outstanding and we wouldn't want to be anywhere else! We look forward to welcoming you to our neck of the French mountains and are sure you will love it just as much as us! Grenier Les Bouts is in a league of it's own. We have fully renovated this building which was once used for grain storage for the main farmhouse. It dates back to 1901 and still holds its 19th century charm. We feel it is a unique property offering a perfect holiday home for a couple. There are so many activities on offer here from skiing and snow shoeing in the winter to biking and hiking in the summer. If you'd prefer to just relax there is a stunning balcony and private patio area with outstanding views. You won't find another property like this in the area! The only Grenier in the area offering luxury accommodation for two. Grenier Les Bouts is completely unique. If you are wanting to holiday with family or friends we also have a spacious 3 bedroom self catered property next door set within the main farmhouse which sleeps 6. Superb shower ensuite containing a large rain shower. - PLEASE, PLEASE DO NOT FLUSH ANYTHING DOWN THE TOILETS EXCEPT TOILET PAPER AND HUMAN WASTE. We experienced significant damage to a property due to sanitary towels, tampons, baby wipes and cooking fat being flushed/washed away down the toilets and sinks. This caused a complete blockage of our drainage system resulting in severe flooding. Please use the bins provided. Please also discard cooking fats into the tin cans which you will find by the front doors. Underfloor heating in the bedroom and bathroom, radiator and wood burner in open plan living, kitchen, dining area. Wood provided winter months only. 2km away is the nearest chair lift. - PLEASE, PLEASE DO NOT FLUSH ANYTHING DOWN THE TOILETS EXCEPT TOILET PAPER AND HUMAN WASTE. We experienced significant damage to a property due to sanitary towels, tampons, baby wipes and cooking fat being flushed/washed away down the toilets and sinks. This caused a complete blockage of our drainage system resulting in severe flooding. Please use the bins provided. Please also discard cooking fats into the tin cans which you will find by the front doors. We stayed in the beautiful Ferme Les Bouts on the 28th February 2018 for our honeymoon!! Very comfortable stay with the most beautiful views, we went for a relaxing 6 days and didn't want to leave. Definitely recommend everyone to stay there with lots to do. We went for long walks with views and shopping in the town only 10 minutes drive away. Will definitely come back for our one year anniversary to try skiing this time!! Thank you for making us very welcome and been helpful. The cottage is as perfect as the pictures show. We arrived at night with no problem to access the cottage. The following morning we woke to a lovely warm sun on the balcony and enjoyed a breakfast created from the provisions left by Katie's the night before. We received a very warm welcome from Katie and some great advice regarding the local restaurant which proved to be extraordinarily friendly and the food was excellent. We went to the region to ski and we weren't disappointed. Cote d'Abroz is close to l'Encrenaz on the other side of the Mont Cherie from Les Gets, where you can start a days skiing in the pretty alpine region. The log burner was perfect accompaniment to a cosy evening in. Location is very tranquil and relaxing, yet a short drive to Morzine. We loved our stay here. It is quite small - but very cosy for 2. The kitchen / lounge is upstairs - very well equipped. The log burner makes the place toasty warm. There is a small balcony with comfy chairs to admire the view of the mountains. Steep stairs (lovely oak woodwork) take you down to the bedroom. Great views from the bedroom and a door out to the patio. It was too cold when we were there to take advantage of this. Katie was very friendly and helpful and had left very generous supplies in the fridge, snacks and a bottle of wine which was a nice surprise. Also all the little things that often are missing like salt & pepper, dishwasher tablets, cleaning things were all provided. The place was spotless and comfy - 10/10! We took the car to Ardent (20 mins) for the first day skiing as it is quick from there to access Avoriaz and environs - which was great. Days 2 and 3 we drove 5 mins up the road to Mont Cherie? which had really great runs and few people. We enjoyed the mornings there hurling down the pistes. Then took the bubble down to Les Gets, which was very busy as it was half term - the queues were a bit slow getting up from Les Gets and over to Morzine but the skiing was great. Also note you don't have to buy the whole Port Du Soleil pass just to do Les Gets / Morzine. Nicest self-catering place we have stayed. Hope to return!! Superbe petit grenier très joliment rénové et tout confort. la neige était au rendez vous! le top! Thank You for your lovely review! We are so pleased you enjoyed yourself and would be delighted to welcome you again. Merci pour votre belle revue ! Nous sommes tellement heureux que vous aimé vous-même et serions ravis de vous accueillir à nouveau. We live is a snowy area during the winter and you must come prepared for driving in wintry conditions. It is a legal requirement to carry snow chains in your car during the winter months in France and the police have the right to stop you continuing your journey if they deem the roads to be unsafe without chains. To make your journey to the region, and everyday driving within the area we highly recommend you hire a car with snow tyres. If you are hiring a car from Geneva airport we suggest you hire from the Swiss side as their cars come with snow tyres as standard (Please check at time of booking). Without snow tyres you will almost definitely need to use snow chains in snowy conditions which can be tricky to put on (often when there is heavy snow fall or late at night) If you are self driving, don't worry if you do not have winter tyres, but please practice fitting your chains before you come as putting them on in blizzard conditions is not the time to do it for the first time!